Q: My husband and I love to cook for each other and our kids, but our dining room is so drab we usually end up eating from our kitchen counters. Any advice on how to beautify this space? A: On the surface, dining rooms are straightforward, functional spaces. The layout is obvious, and the furniture selection basic — a table, chairs and some sort of sideboard. With so little to play with, why are some dining rooms inviting, comfortable and attractive, while others are, well, boring? How do you turn an ordinary dining room into something special? The good news is you don’t need a huge budget to create a truly awe-inspiring dining room. But you may need to take a step or two out of your comfort zone. Here’s what you’ll need to do. Go deeper with color. If there is one room in your house where you can embrace darker walls, it’s the dining room. Deeper tones lend a sense of drama and mystery and form a perfect backdrop for candlelit dinners and intimate gatherings. When you select your wall colors, don’t be afraid to start on the dark end of the sample paint strip. Add an eye-catching element. Your dining room needs a focal point. Unless you have a spectacular view or large patio doors opening to an outdoor area, you should add a striking design element to draw the eye into the room. This could be a stylish bookcase, an oversized mirror, a large piece of artwork, or a collection of smaller artworks installed in a grid. Hang a dramatic light fixture. The light fixture above the table is the key element in your dining room — it sets the tone and defines the personality of the space. Do something special here. This is your best chance to strike an adventurous chord with an exceptional light fixture, an oversized pendant, or a splendid chandelier. Remember to install a dimmer switch for complete control and flexibility. Mix up the furniture. Matched sets of furniture are a thing of the past. The best dining rooms combine furniture from different sources. The fun part is that you don’t have to go out and buy everything new; you can play around with different styles and odd pieces. A set of contemporary dining chairs can look great with Grandma’s old table, or a used, repainted sideboard. These quirky pieces pique curiosity and can become great conversation pieces. Bring it together with a rug. Rugs add color, texture and pattern. They also protect the floor, absorb sound, and in open floor plans define specific areas. Not everyone loves a rug in the dining room, but if you decide to use one, make sure it’s big enough for the chairs to pull out completely from the table without getting stuck on the edges. If you have hard flooring, the rug should be sized to act as a perimeter for the dining area. Go for pairs. Because of the centrality of the table, dining rooms lend themselves to symmetry. This can be achieved by balancing different pieces with the same visual weight or height on both sides of the room. 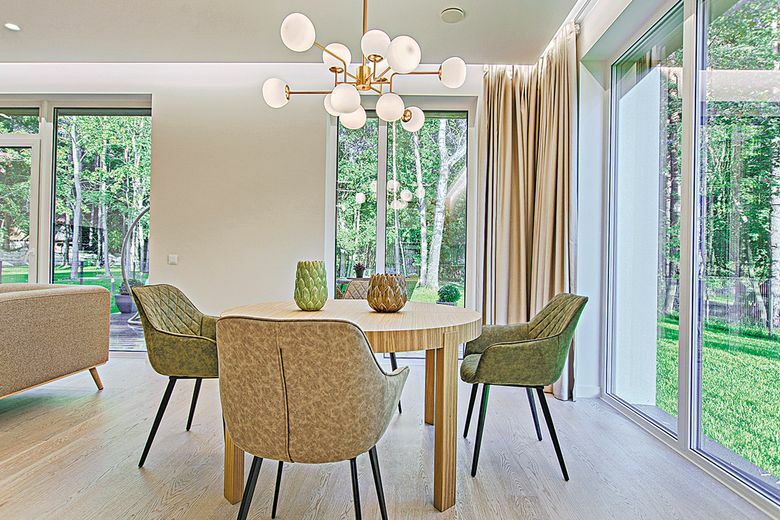 However, matching sets of two work particularly well: twin table lamps on the server, a set of well-spaced wall sconces or a pair of captain chairs on both ends of the table add a sense of stability, balance and comfort to the room. With these tools at hand — and a bit of courage — you will be well on your way to transforming your ordinary room into a gorgeous, inviting space that will delight your family and guests. So, raise a toast to your new dining room and many wonderful meals to come. Mia Hannom is the owner of In Form Design, which is a member of the Master Builders Association of King and Snohomish Counties (MBAKS). If you have a home improvement, remodeling or residential homebuilding question you’d like answered by one of MBAKS’s nearly 2,800 members, write to homework@mbaks.com.